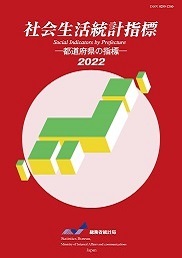 The "Social Indicators by Prefecture" is a report based on prefecture-specific primary data on statistical indicators which are set using basic data developed for the System of Social and Demographic Statistics of Japan. It includes 587 social indicators and 554 items of basic data (published in February 2019). In addition to this report, two reports titled "Statistical Observations of Prefectures" and "Statistical Observations of Municipalities" are also published. The "Social Indicators by Prefecture" consists of four parts: "I. Social Indicators", "II. Basic Data", "III. Explanation of Terms", and "IV. Explanation of Indicators".